In this post, we focus on a WordPress feature that allows users to easily add content and applications to their site and reconfigure elements of their site layout with no coding or programming skills required… WordPress Widgets! Widgets are self-contained modules of code that perform a specific function, such as adding a form, text box or menu to your site. 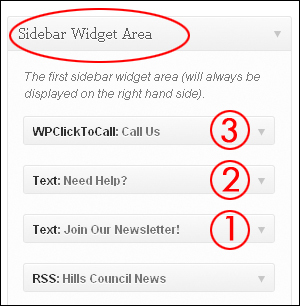 Widgets also allow you to easily add, reorder and/or remove different types of content and programs on your site. 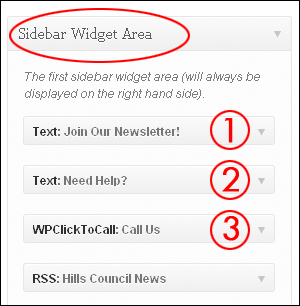 In WordPress, you can also “drag-and-drop” widgets around inside sections of your administration area to quickly rearrange the layout of your sidebars, headers and footers. WordPress is written using a scripting language called PHP (Hypertext Preprocessor). 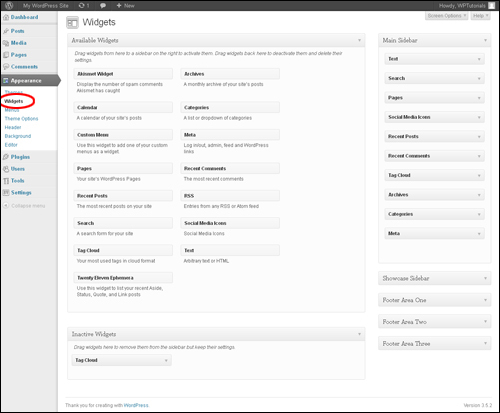 Widgets eliminate the need to know how to program PHP or manipulate PHP code to customize your site’s content and layout, and can be used to extend the functionality of a number of WordPress plugins. Many widgets even allow you to fine-tune their settings to further enhance their function and usefulness. 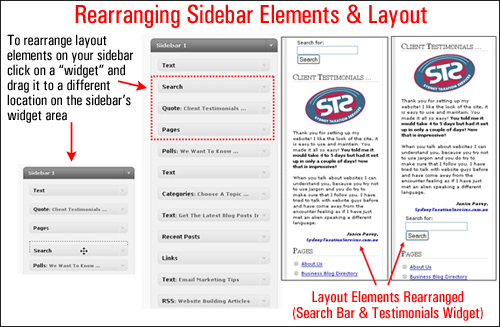 Rearrange how various elements display on your sidebar using simple drag-and-drop. 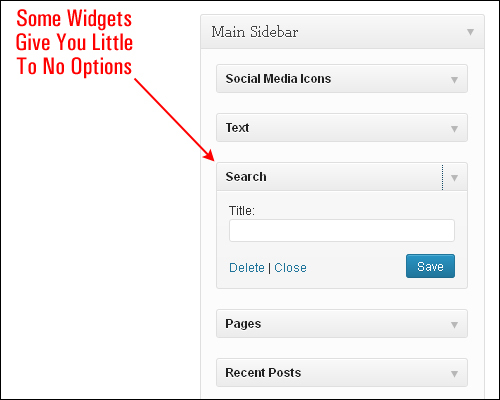 Widgets were originally designed to provide a simple and easy way of giving WordPress users design and structure control of their WordPress Theme. 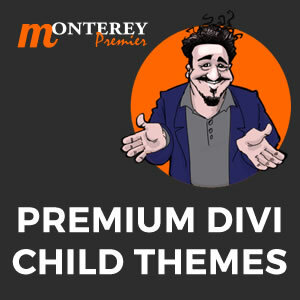 WordPress themes that are properly “widgetised” allow users to control many design and structural aspects of their site’s sidebar, header, footer, and other areas. With most static websites, changing the site’s layout requires editing code in the site’s pages or templates. With WordPress you only need a few clicks of the mouse to completely rearrange how information is displayed in areas like your site’s sidebars, footers and navigation menus. In the above screenshot, you can see that we have rearranged the sidebar layout by switching the search and testimonial sections around. This was easily done by simply dragging and dropping the widget elements into different positions in the sidebar widget section. 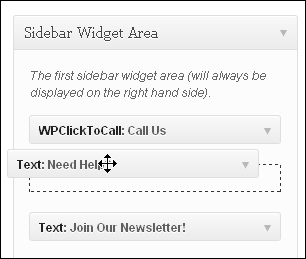 In the screenshot below, you can see that the right hand sidebar of the site displays a newsletter sign-up form at the top (1), then a “contact support” button below it (2), and a “click to call” function below that (3). 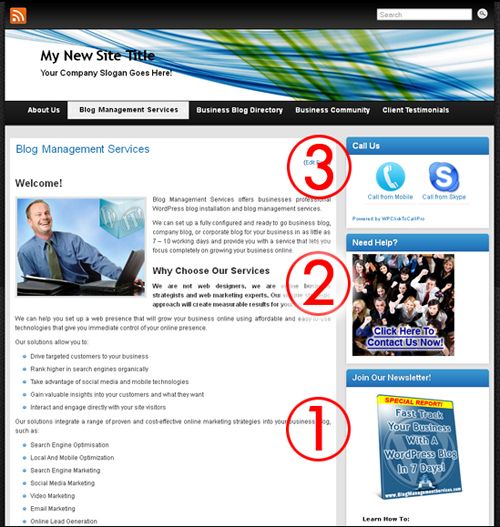 As you can see from the screenshot above, the features appear on the site in the same order as they have been arranged in the widget bar. 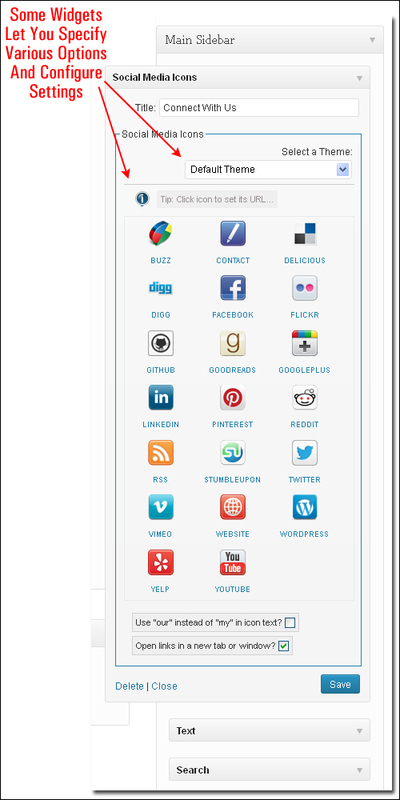 And this immediately changes the layout of your site’s sidebar, as you can see in the screenshot below …. 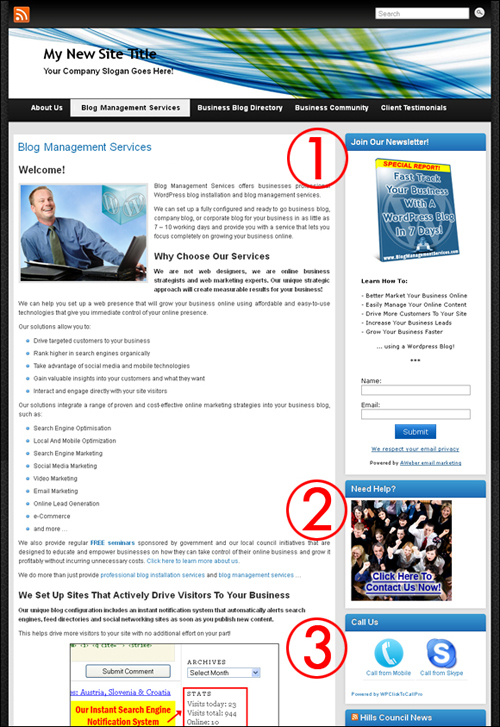 Note: in the screenshot above the “click to call” feature (3) is now at the top of the sidebar menu, and the “contact us” graphic button (2) is located above the newsletter sign-up form (1). 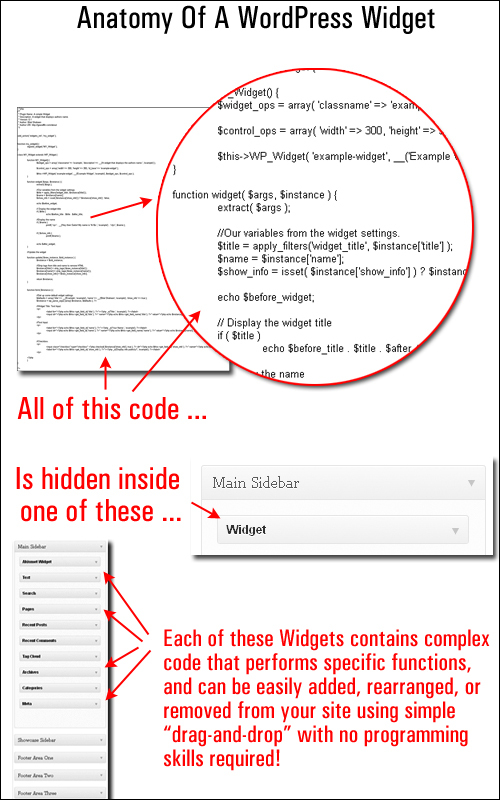 Hopefully, you can see from the above examples just how powerful widgets really are and why they are such an important WordPress feature.